Selecting an air compressor at first seems so simple. How tough could it be? All you have to figure out is how much air you need and decide how much you want to spend. Right? Actually, there are multiple factors that must be considered to find the right compressor for the job. From air pressure to horsepower, a contractor must identify the proper balance of features to meet his or her needs. Let’s break out some of the key factors to help make the decision process a little easier. When looking at hand-carry or wheeled air compressors, portability will be a given. The bigger concern will be ensuring the model also meets the pressure and capacity requirements of the job. 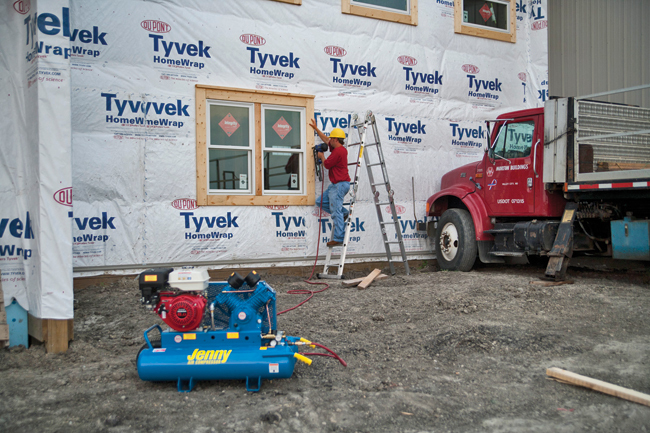 With their low weight and compact configuration, these air compressors can go pretty much anywhere — with one condition — which is what we need to look at next. The next obvious step involves considering where the compressor will be used. If working in a remote area without access to electrical power, either from the grid or from a generator onsite, the only choice is a gasoline engine model. That will offer mobility around any jobsite. But there may be other issues that come into play, such as environmental restrictions — emissions in a confined space or noise abatement — that cancel out the advantage of convenience. The gasoline model also will have both a higher purchase price and the ongoing costs will be greater, but it will provide higher actual horsepower than its electric-motor counterpart. 1. Displaced CFM (DCFM) is simply a mathematical calculation of the bore, stroke and rpm. But, it does not take into account any of the important variables, like temperature, atmospheric pressure, humidity, friction or heat dissipation, and therefore it means almost nothing in the real world. 2. Standard CFM (SCFM) is a better measure of reality. SCFM is the flow of free air in a standardized environment — such as 14.5 psi atmospheric pressure (the pressure at sea level), 68 degrees Fahrenheit and 0 percent humidity. But what about individual needs? For example, if someone is working in mile-high Denver in January, it surely isn’t going to be 68 degrees. Or, a person could be in Louisiana in July, and the humidity is off the charts. 3. Actual CFM (ACFM) figures in the variables that apply to unique situations. It will provide output of the pump for the actual working conditions. But ACFM is a hard figure to get, precisely because it does require site-specific data and calculations that may be best left to an engineer. For selection purposes, the best bet is to compare compressors based on the SCFM ratings. This puts all units on a level playing field for a true apples-to-apples comparison. CFM will also be important to know when considering a single-stage compressor vs. a two-stage model. Begin by listing the minimum operating pressure requirements for the tools that will be used, which will indicate whether a single- or two-stage compressor is needed. Single-stage compressors are fine up to 150 psi. Anything more will require a two-stage. A single-stage compressor will typically have a higher CFM rating, because the cylinder is drawing in air and compressing it with every rotation, whereas a two-stage is compressing the air up to an intermediate pressure in one or more cylinders and then passing it on to another cylinder to finish the job. Because the air is typically passed through an intercooler between stages, a two-stage compressor is more efficient at higher pressures. Once again, the capacity of the compressor tank, which is usually measured in gallons, depends on how the compressor will be used. If running tools that require quick, concentrated bursts, such as nail guns, a small tank is best. If the tools are to be used for sustained periods, such as impact wrenches, a larger tank will work better. Overall, the most critical issue to keep in mind is job analysis. To select the right compressor for your operation, it’s best to understand the requirements of your current and future projects. Start by creating a realistic checklist using the factors outlined above. From there, it will be much easier to find a unit that will meet your needs and keep your business powered for years to come. Dan Leiss is president of Jenny Products Inc., based in Somerset, Pa.
Make sure the air compressor is clean from previous work. It will be easier to detect leaks and broken or loose components on a clean machine. Before turning on the machine, do a visual inspection. Check the hoses for kinks and the electrical wiring, tubing and piping for any damage. Also check the controls, gauges, accessories and instruments to make sure there are no loose mountings or visible damage. Check all connections and tighten any loose nuts and bolts. The next step is to check the pump oil level. To do so, first disconnect the power source and place the compressor on a flat surface. Remove the oil fill plug and check the level, then insert a screwdriver into the crankcase. Inspect the oil on the screwdriver. If there are signs of contaminants, such as water or dirt, change the oil. Otherwise, change the oil annually. If a gas engine powers the compressor, check the engine oil level, as well, which also should be changed annually. Fuel filters may be changed to accommodate an air compressor’s daily task. There are two types of filters: standard and coalescing. A standard filter will trap dust particles based upon micron size, while a coalescing filter will remove water and oil from the air. Provided the correct filter is used for each application, it should only need to be replaced monthly or every few months.